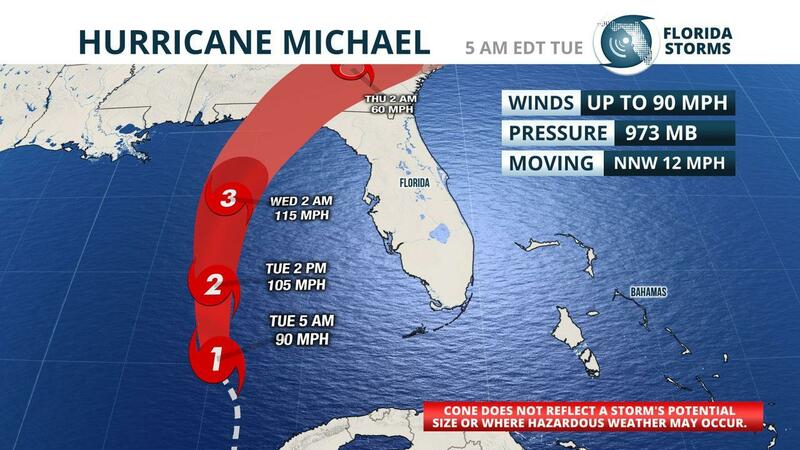 At 10 a.m. Tuesday, Michael's top sustained winds had risen to 110 mph as it headed north at 12 mph. The storm was centered about 360 miles south of Apalachicola and 335 miles south of Panama City. Pressure was down to 965 millibars. Hurricane-force winds extended outward up to 35 miles from the core and tropical-storm-force winds out 185 miles. 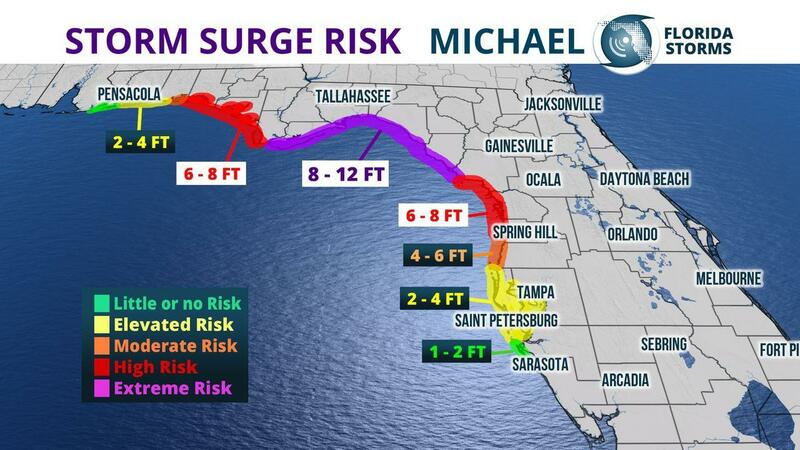 The storm surge is expected to reach up to 12 feet in some areas of the panhandle. After it makes landfall in the Panhandle or Big Bend, the storm is expected to head northeast across Georgia and the Carolinas, still recovering from widespread flooding damage from Hurricane Florence last month. Meanwhile, forecasters say Tropical Nadine has formed in the open Atlantic but poses no threat to land. A Storm Surge Warning has been issued from the Okaloosa/Walton County line to the Anclote River, which is near the Pasco/Pinellas county line. A life-threatening inundation of water is likely in the warned area, with the height of the water above normally dry ground potentially reaching 8 to 12 feet in areas from Indian Pass to Cedar Key. 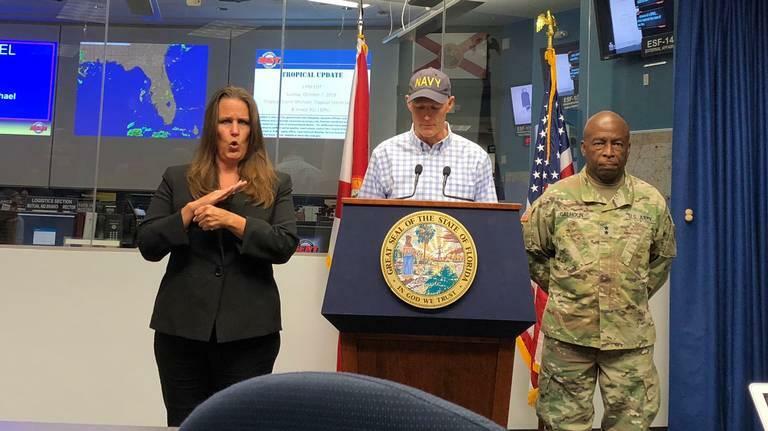 In a statement issued early Monday evening, the National Weather Service Tallahassee said water level rises this high could potentially be “catastrophic” to the northeast Gulf Coast. Other storm surge inundation forecasts include 6 to 8 feet from Cedar Key to Crystal River, 6 to 8 feet also from the Okaloosa/Walton county line to Indian Pass, and 4 to 6 feet from Cedar Key to the Anclote River. 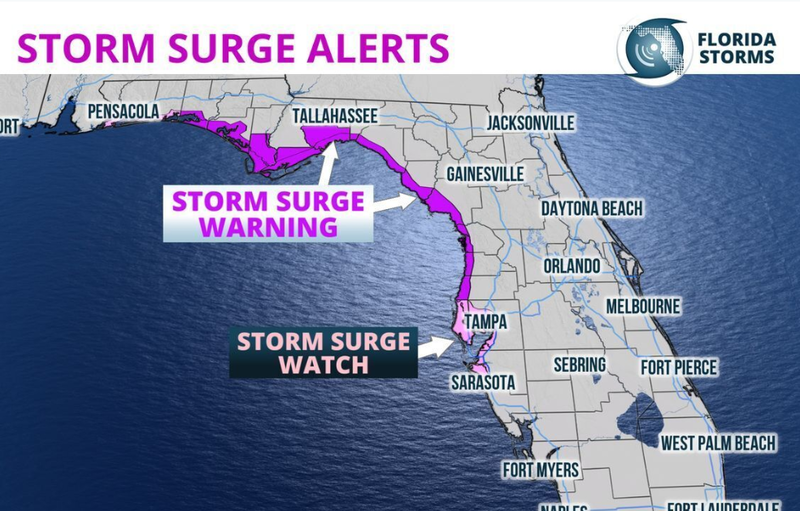 ;A 2 to 4-foot surge will be possible along the coast further south in to the Tampa Bay metro area, and further west to the Alabama/Florida border. In his forecast notes supporting the 5 pm advisory from the National Hurricane Center, Hurricane Specialist Dan Brown noted that the location and magnitude of peak storm surge flooding would be “very sensitive to small changes in the track, intensity and structure” of the hurricane. And since there is still some uncertainty in all of those parameters, the official NHC storm surge forecast included “various plausible scenarios”. Every county in the Florida Panhandle has been placed under a Hurricane Warning, which also extends into coastal Taylor and Dixie counties. 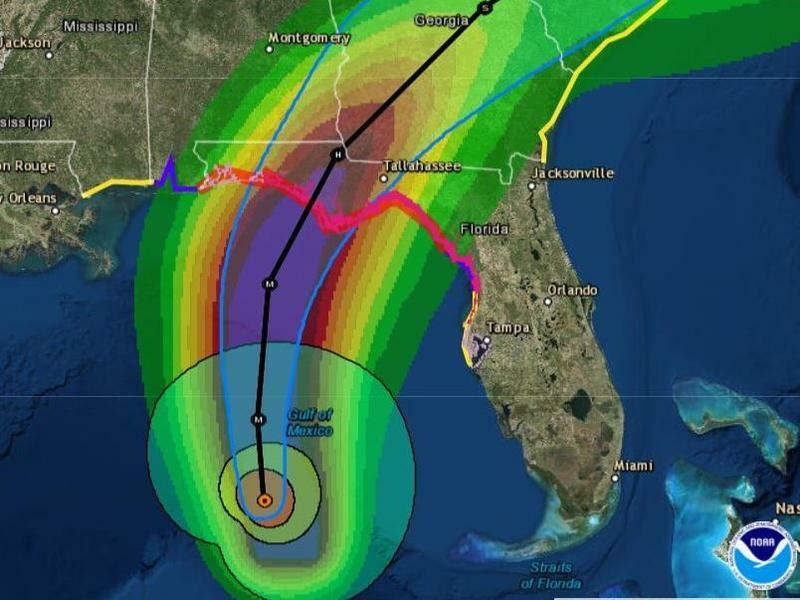 Further inland and farther south along the west coast of Florida, a Tropical Storm Warning was in effect to the Pasco/Hernando county line, and a Tropical Storm Watch extended as far south as the mouth of the Pearl River. The Hurricane Warnings are issued when winds of 74 mph or greater are possible during the event, but also when tropical storm force winds are likely within 36 hours. When the latter arrives, it will make completing hurricane preparations nearly impossible. Due to the aforementioned uncertainties of the storm’s eventual intensity, track and structure, how extreme the winds may get at any particular location are still a bit difficult to pin down. What is clearer, however, are when the tropical storm force winds may arrive, and we’ve listed some “most likely” times of arrivals below, from earliest to latest. Hurricane Michael could produce enough rain over a short amount of time that leads to flash flooding of many low-lying areas near where the storm comes ashore. Rainfall amounts of 4 to 8 inches are expected over a large area from Panama City to Tallahassee, potentially spreading as far east along the I-10 corridor as Lake City. Lower rainfall amounts of 2 to 4 inches are expected along the Nature Coast and inland areas of North-Central Florida, but here too locally heavy rain could cause flooding in poor drainage areas. The story will be similar for areas west of where Hurricane Michael comes ashore, with isolated flooding possible as far west as Pensacola. Most landfalling tropical storms or hurricanes bring with them a tornado risk, and it’s usually greatest on the right side (or in this case, the eastern side) of the storm’s track. 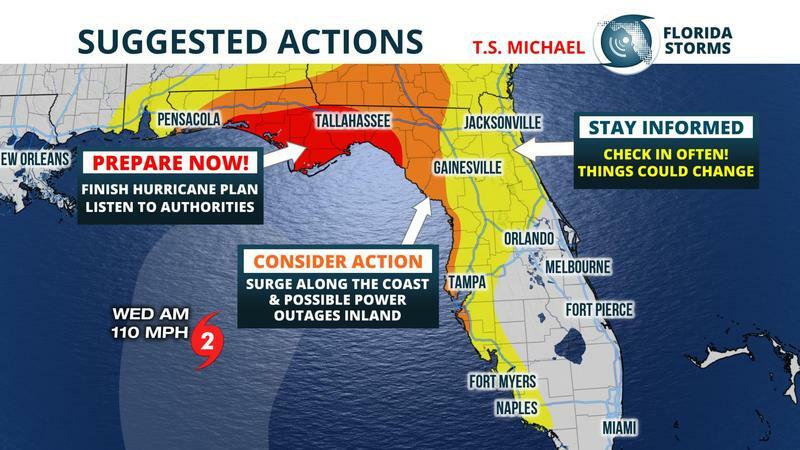 Outer bands from Hurricane Michael could produce isolated tornadoes with little notice over portions of the Florida peninsula Tuesday afternoon through Thursday. Residents in these areas are encouraged to have a way of being alerted should a warning be issued. 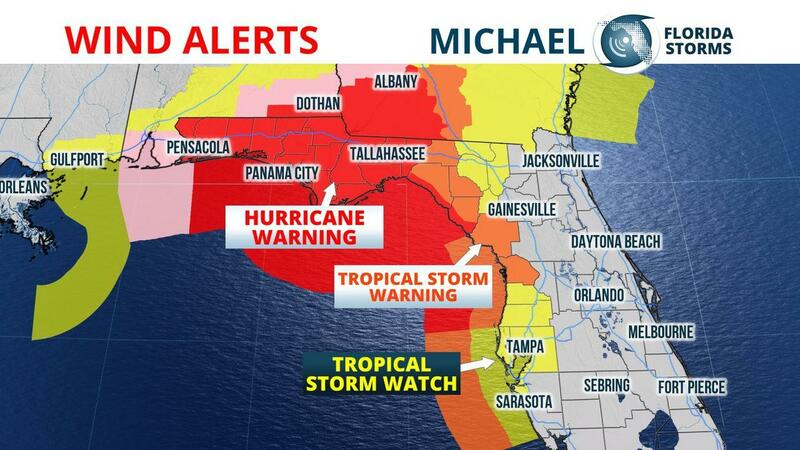 The Florida Public Radio Emergency Network will provide hourly updates on Hurricane Michael to your local NPR affiliate beginning Tuesday morning, along with several live streaming updates on the Florida Storms Facebook and Twitter accounts. Information from the Associated Press and FPREN was used in this story.